American Yacht Club’s Junior Big Boat Team sailed their J/105 Young American (Rye, NY) to first place in PHRF 1 and third overall in the PHRF division in the Storm Trysail Club’s 69th Annual Block Island Race, which started May 23 from Stamford CT. Young American was also awarded the Harvey Conover Memorial Overall Trophy, presented to the boat that has won her class and, in the judgment of the Flag Officers and Race Committee, had the best overall performance. 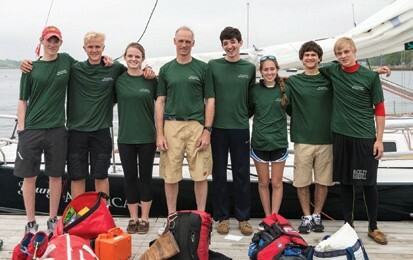 The all-junior crew, ages 15 – 17, included returning Block Island Race veterans Key Becker, Nick Davis, Will McKeige and Sam Papert, joined by team members sailing the Block Island Race for the first time: Austen Freda, Emily Miller and Aisling Quirke. 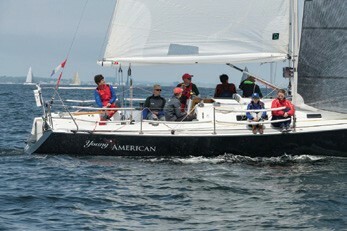 The team once again sailed with Peter Becker, Chairman of American’s Junior Big Boat Program. George David’s Reichel Pugh 90 Rambler (Hartford, CT) was the overall winner of this year’s race, completing the 186-nautical mile race from Stamford, CT to Block Island and back in just over 17 hours. The big boats enjoyed better wind and better current in both directions, while the smaller boats had the current turn on them for the trip back from Block. Young American finished 21 hours after Rambler, crossing the finish line off the Stamford Yacht Club breakwater before dawn on Sunday. After sailing for nearly 40 hours, the Young American crew had no idea how they had done and that they were the first boat to finish in their division. The next closest boat in PHRF 1 finished some three hours later, allowing Young American to hang on to first place after the corrected times were calculated. The challenges of prepping their own smaller boat for such a long race did not deter the team. A few days before the start on Friday, the crew met at American Yacht Club to discuss race preparations. Peter Becker reviewed the latest weather forecasts with the juniors. Predictions of light winds, rain, temperatures in the 50s at night and 60s during the day had Young American tracking for a 48-hour race in challenging conditions. Next on the agenda was a review of the gear list. Several team members had previously done overnight distance races and participated in the Storm Trysail Foundation’s Junior Safety-at-Sea Seminar and most had personal safety gear including strobes, whistles and headlamps, and others were able to borrow from other teammates. There was a last minute scramble to line up a life raft and extra safety harnesses, borrowed from fellow AYC members. One of the hallmarks of American’s Junior Big Boat program is that the sailors make the decisions, and provisioning is no exception. Imagine provisioning a J/105 with no refrigeration and only a tabletop ring burner, when your crew is seven ravenous teenagers who will be on board for two days. The remainder of the prep meeting was taken up with debate about the merits of meatballs versus pulled pork (bring both), and the ideal candy for a marathon sail (Skittles). One of the boys suggested adding ramen noodles to the shopping list, a fortuitous idea since by Saturday afternoon Pot Noodle was among the few remaining food options. Sam Papert took the helm for the start. For parents with a junior on board, there is little information during the race. Fortunately a diligent race committee at the finish line in Stamford was posting finishes to YachtScoring.com in real time. Those results showed that Rambler crossed the finish line at 8:44 am Saturday. That afternoon, parents received a text from Peter Becker with the news that they were back through the Gut and on the homestretch, but based on a few photos of very calm seas and slack sails, it appeared it would be a long night. By early evening a number of the bigger boats had finished, and just after 9 pm the first PHRF Division boat, Oakcliff Sailing’s Farr 47 (Oyster Bay, NY) came in. At 4:36:05 Sunday morning, the race committee recorded that Young American had crossed the finish line first in their division. Then there was the long wait to confirm that in fact no other boat in their division would beat them on adjusted time. The team returned home to American and some boat cleanup. After a few hours of catching up on sleep (and social media) later that day, several of the team went to the awards ceremony at Stamford Yacht Club. The honor of being awarded the Harvey Conover Memorial Overall Trophy at the discretion of the race organizers was a surprise, but one that underscored the accomplishments of this team and the mission of American Yacht Club’s Junior Big Boat Program. AYC’s Junior Big Boat Program has a long history, and Peter Becker is able to share stories with the current team about his days as a junior in the program, sailing on AYC members’ boats. In 2013, under the leadership of current Co-Chairs Peter Becker and Rob Alexander, the team began actively racing Young American, which is dedicated to use by the Junior Team. The goal was to take the juniors beyond the traditional Long Island Sound big boat activities of the Dorade and Beach Point overnights, and have them compete in a variety of buoy races and distance events. Navigation courses and the Junior Safety-at-Sea Seminar are also important elements of the program. 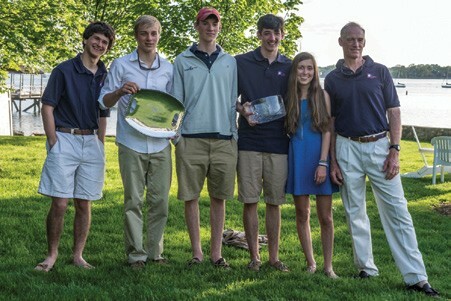 The AYC Junior Big Boat Team tuned up Young American this spring with second place finishes in the Edlu and NYAC Stratford Shoals distance races. 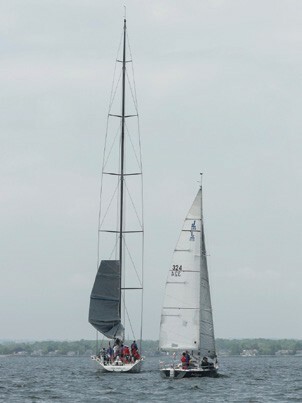 They also competed in the AYC Spring Series, placing fourth in the J/105 division. They are actively sailing in Yacht Racing Association of Long Island Sound Can One races on Thursday evenings, a series that they won overall in 2013. Paula Schaefer is a parent of one of the junior crew on Young American.